Remember my themes for 2013? Well, when I put together my themes for each month, I broke each one down into more specific goals. I also threw in some inspirational phrases & a quote to keep me going. 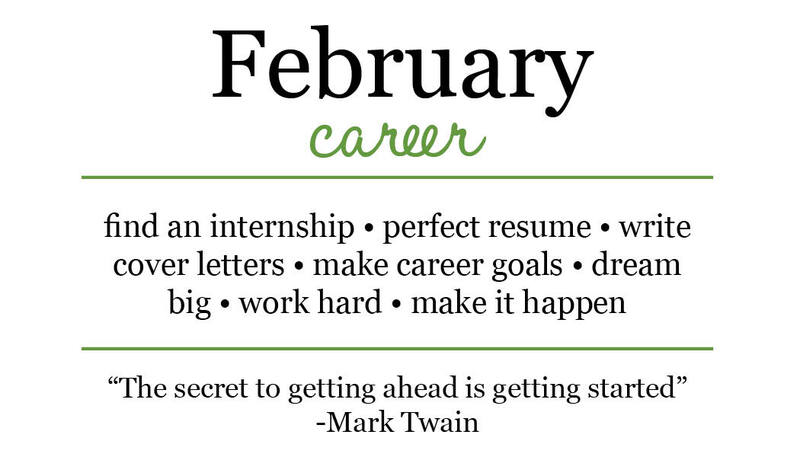 My big goal for February is to find a summer internship. In my effort to do this, I’ve met with an adviser to critique my resume, attended a career fair, updated my LinkedIn, created an about.me profile and brainstormed some pretty big career goals. Yep, it’s been a busy week. Not only have I been working on my career goals, but I’ve spent hours looking at resumes and cover letters for my job on campus. I helped hire a new office assistant, filed resident assistant resumes and reviewed cover letters and resumes for building director candidates. I’ve seen quite a few resumes in the past couple of weeks (we had over 500 candidates for resident assistants!). Visit Career Services | Your campus has some kind of career services, I promise. The advisors are there to help you & in just thirty minutes you will walk out with great advice. Follow K.I.S.S. | K.I.S.S. (Keep it simple, sweetheart) is key! If you’re a college student, your resume should never exceed more than one page!! This is a major pet peeve of mine. It’s better to keep things conservative than using some crazy design. Features & Benefits | Change your perspective writing your résumé. Take your experiences and “features” and relate them to how you will benefit the company you’re applying to. Everything on your résumé should be relevant to the field you are pursuing. Use Levo League | If you haven’t checked out Levo League yet, you need to, right now. There are so many great resources! I’ve been known to spend hours on end browsing through articles and watching old office hours. What are your favorite career/job search tips?